Last weekend I set aside some time for drawing. None of these drawings are for their own sake but a way of testing ideas and I had some specific things I wanted to try. The results were mixed and I have some conflicted feelings about them. First I did a series of ink drawings where the focus was on exploring layers of ink wash. I had not planned that they would turn into a series of “mountain-scapes” but they did. The first was simply an intuitive response to what I was doing at that moment, but then with the next few it became progressively more deliberate … and I became progressively more dissatisfied. I’ve been pondering the reasons for this dissatisfaction. What I don’t like is that the drawings became more explicit, more literal as I went on – too much so for my taste. They are unequivocally mountain-scapes, leaving no room for alternative interpretation. Yes, they are atmospheric and “pretty” … but in a way I find rather predictable – even trite. They encourage a superficial response. The ones I like best are the simplest and also the more ambiguous. It’s as though I had followed a path that, while perfectly pleasant, was not leading me somewhere that I wanted to go. Although I sort of recognised this at the time, it was hard to change direction rather than continue to follow the track I was on. Once my initial crossness with the drawings had passed, over the ensuing days I started to think of ways I could take the method I had been using and push it in a different direction. The second set of drawings was something I’ve had in mind for a while. They are based on photographs of recently cut hedgerows and inspired in part by Brice Marden’s Shell Drawings. I was interested in developing the calligraphic qualities of the twig shapes. Curiously I didn’t enjoy the process of making these drawings that much, although I forced myself to do enough of them to expose a reasonable range of options. I do like the results better. The challenge here is how to develop them further. Initially it felt like a dead end – how on earth could I use these? Their monochrome character, which is part of their appeal, is problematic with dye. But gradually I have been identifying some ways forward. If I had written this post last weekend it would have been a stream of irritation. It’s lovely when I do something and it just works, but there are lots of times when they don’t. Sometimes I need to allow some time to pass before I can see where to go next. And sometimes I have to recognise when I’m going the wrong way and need to retrace my steps. I've had some good studio days recently. I've started several pieces of new work - although I think of them as a continuation of the work I was making last summer rather than truly "new". It feels good to be making again. A relief actually. Because, looking back, I feel as though I've been stuck for the last six months. However I'm feeling clearer about what I want to do next. Which makes it easier to work out how I'm going to get there. I will need to spend some time experimenting and sampling to find ways to get the effects I want and, more uncomfortably, I think I need to let go of some of my favourite techniques for a while. They won't give me the look I am after and also I think I have got into too much of a routine with some of them - it's all a little too predictable. It's a guide, not a prescription. We'll see where it leads. In the meantime, some good advice I was given was to keep making my existing work while I develop the new. So there are five or six new pieces coming into shape on my studio wall. I am liking these muted colours very much. I think I have a new favourite piece. Over these blue mountains was all about edges. Lots of minute stitching. 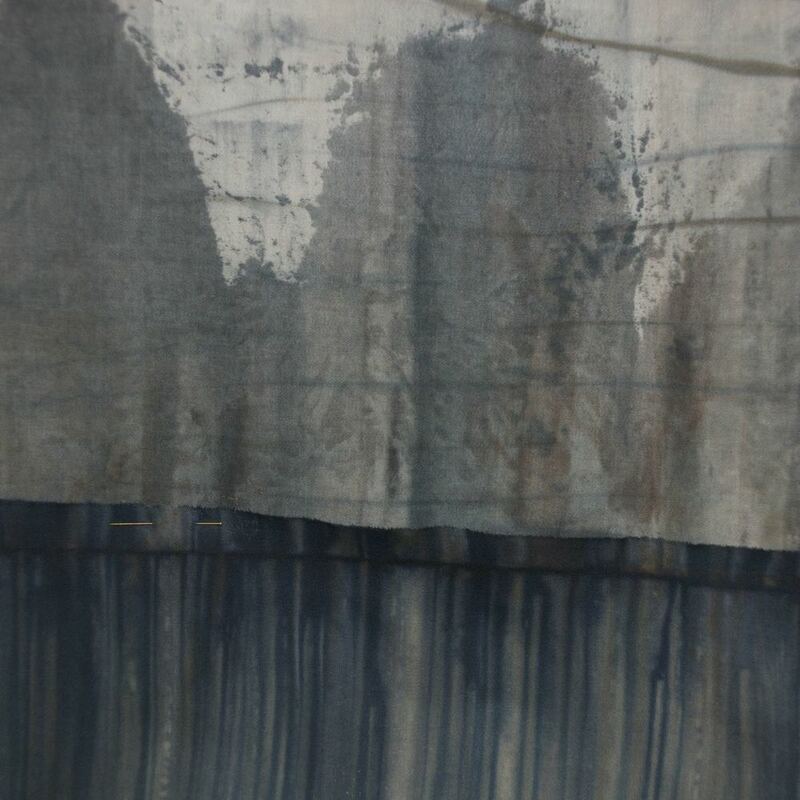 I felt as though I was conjuring the forms of the mountains out of the marks left by the dye on the cloth. Two posts back I reflected on how the marks on my flints have their own cause, but when I look at them I interpret them in certain ways according to my own memory and experience of similar marks. And now I found myself following the same process with the marks on the cloth - their true origin relates to dye chemistry and application but through selecting and emphasising specific edges and marks over others I was drawing out their resemblance to something else. In the top and bottom sections, stitching became a game of defining and dissolving edges. In some places lines of stitch hold down actual cloth edges; in others they merely create the illusion of an edge. I was making decisions every time I selected a thread colour, placed a stitch or ended a line as to where the "edges" were and whether they were strong or faint. Sometimes I was following marks in the cloth so indistinct that even I was not sure whether they were really there. It dawned on me that I was playing directly with Tim Ingold's distinction between traces and threads. Ingold argues that most lines can be classified as one or the other. "A thread is a filament ... that can be entangled with other threads or suspended between points in three-dimensional space. ... threads have surfaces, however they are not drawn on surfaces." In contrast "the trace is any enduring mark left in or on a solid surface by a continuous movement." I was using the traces left by dye on the cloth as a guide to where to place lines that I was making with a continuous thread. And while I was focusing on what was happening on the front - the way the stitches were interacting with the dye marks - something else was happening on the back. My thread was marking its pathway across the cloth with another pattern of stitches, livelier and more random than the carefully considered choices I was making on the front. Conscious, deliberate decisions on one side; unconscious, accidental effects underneath - but each a direct consequence of the other. 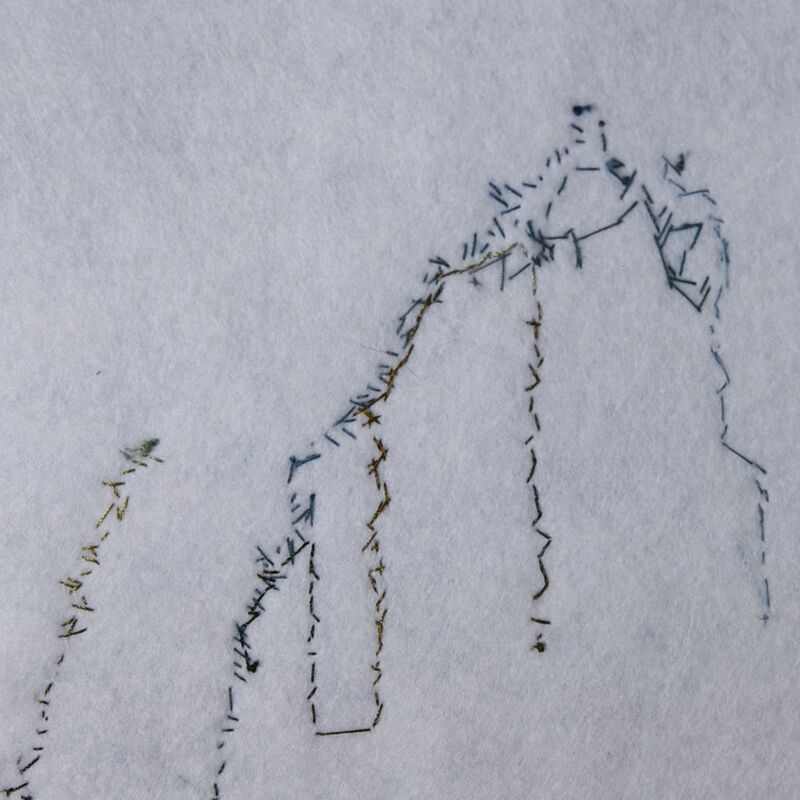 It's a pathway - in the sense that it traces a route - but it's different from the line we would mark with our feet or draw on a map because it's marking the spaces / movement between each stitch / step rather than the steps themselves. 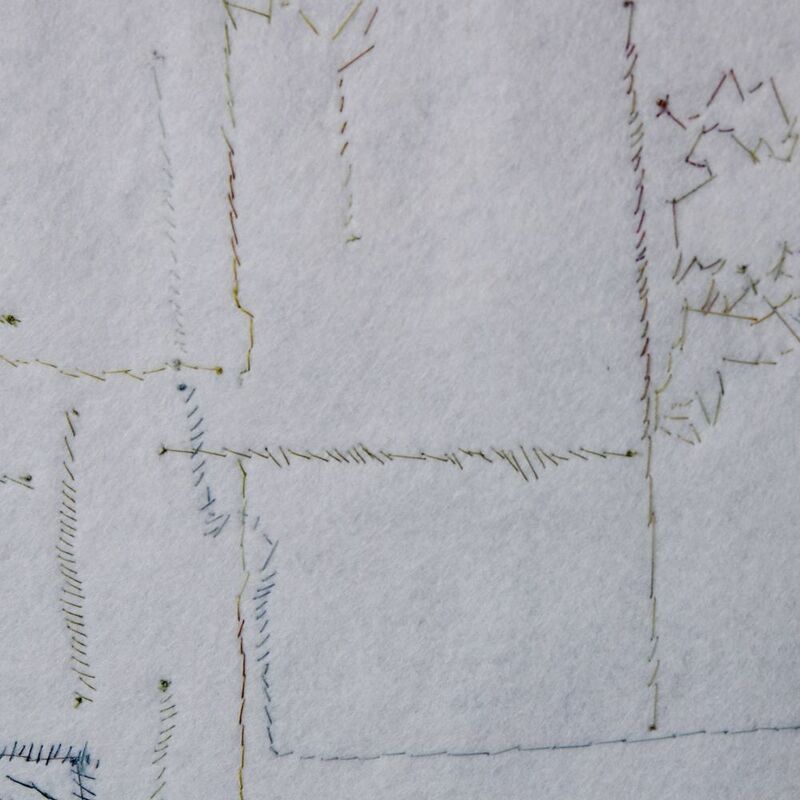 I like the freedom and liveliness of these accidental stitches and I'm pondering ways of recreating the effect. If I simply turn the cloth over, I will lose a lot of control over how each stitch relates to the marks on the cloth. If I copy the pattern of the stitches on the back, they will lose some of their spontaneity. This is interesting in itself! Need to experiment with this. If this seems a particularly introspective post, this is how it is with me when I am stitching. While I am very focused on what I am doing, my mind is free to reflect. I think this is why I prefer hand stitch. It is a physical process that keeps the mind engaged in a way that's different to when I sew with a machine. Each stitch is an individual decision but there is time for the mind to explore different trains of thought. It is when I am stitching that I spend the longest period with each individual piece (and this is usually when I work out what to call it). I notice things I didn't see when I constructed the piece, new ideas emerge, new links and associations are made and I come up with new things I want to try. More on Tim Ingold's thinking on lines here.